The One Thing Christians Should Stop Saying was shared with me by a treasured friend. The author, Scott Dannemiller, boldly addressed the popularized expression: “I’m blessed”. 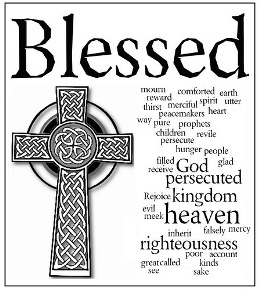 Jesus told us who was “blessed” in Matthew 5: 1-12. I highlighted verse six for a reason. This past weekend, I spent Friday night and most of the day Saturday at a woman’s retreat as a guest speaker. Our theme was “Instruments of Righteousness” based on the verses from Romans 6:13-14. Do not present your members to sin as instruments for unrighteousness, but present yourselves to God as those who have been brought from death to life, and your members to God as instruments for righteousness. For sin will have no dominion over you, since you are not under law but under grace. I can’t begin to tell you how much I prayed for the presence of the Holy Spirit to fill me with His Words, and for His presence to dwell among us and change us. I was once again AMAZED at constant confirmation from Him as I prepared, and the power He displayed in this tired, simple, ordinary woman. I felt Him walk beside me and guide every step not only with the message, but also where to be in a given moment to receive confirmation and direction on how to serve Him. I was satisfied and filled by Him as we all hungered and thirst for His righteousness. At church this Sunday, Pastor Stan, of Cloverhill Assembly of God, shared a message on “Bless Me Indeed!” I rejoiced that God saw fit to take the article by Scott, my weekend, and a Sunday sermon to bring it all together. Pastor Stan admonished prosperity preaching and shared the prayer of Jabez. I was so touched by his message, I desired to spend a few blog posts throughout the coming weeks on this message and the work God did throughout the ladies’ retreat weekend. Scott was grateful for God’s provisions, and knew that he was called to be used by God. Next My Cup Runs Over! I always feel blessed by the gifts God gives me – not necessarily the material things, but the people He put in my life, the healing power He sends through me to my clients and how He allows me to be a blessing each and every day to all who’s life I touch – the opportunities to serve Him, even if I don’t recognize them as that at the time! The opportunities are endless and are in small things like seeking to understand, listening, smiling, encouraging. Char–you are filled with Him and bless so many through all these things and so much more with your gifts.